Since I was in SF, I decided to check out the SF Underground Farmers Market. But more on that later. First, on my way there, I stopped at Electric Works for an art opening. They were giving out some excellent white wine by Bear Flag. They’re a CA winery out of Modesto, and they only do blended wines. 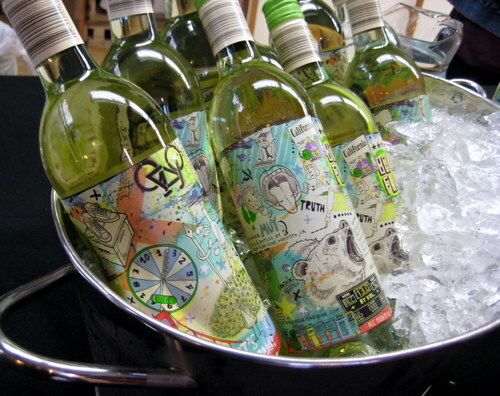 The artwork on the bottles is also adorable and heck, the wine rocks. Now I want to buy some! 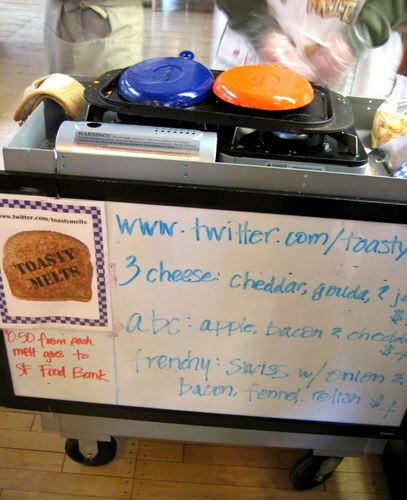 The reason I stopped in was to check out Toasty Melts, one of the bazillion cart food vendors in the bay area. What is a toasty melt? I’m not sure if it’s a regional name, but as you can see, it’s grilled cheese. I guess toasty melt sounds a bit more exotic than grilled cheese. 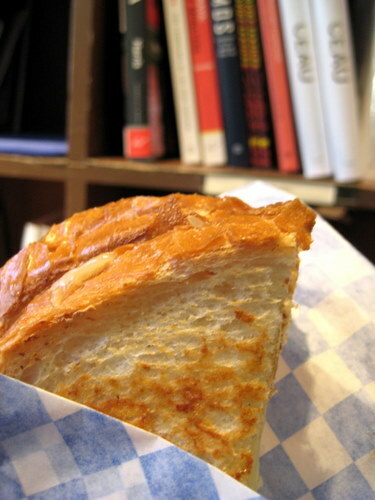 The Toasty Melt version is made with vienna bread. I got the 3 cheese one and it was delicious! It was warm, the cheese was all gooey and melted, and I just loved it. It’s a good size too as the bread pieces are quite large, and they cut it in half before they put it in the cute little paper for you. Ok, back to the SF Underground Farmers Market… What is it? It’s a monthly event where various people sell food that is being produced in backyards and home kitchens in the Bay Area. 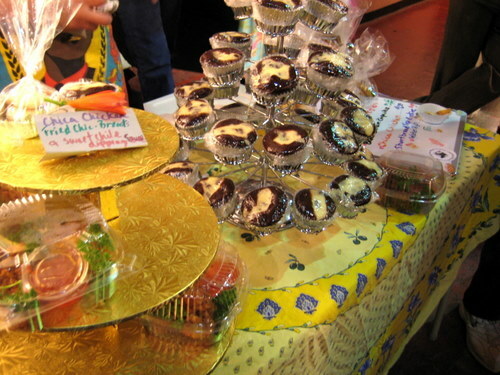 It is held in a different location each month and features all types of random vendors. 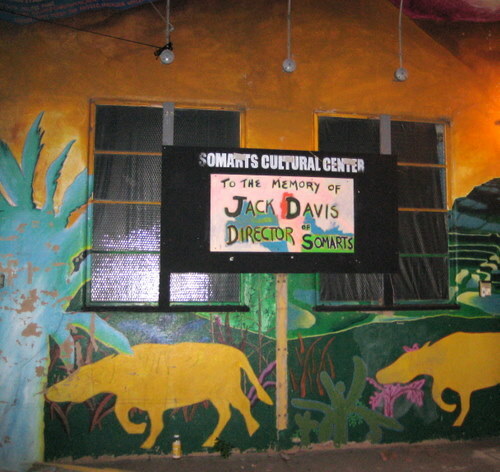 There is also live music, and sometimes workshops, and is held at night. When I got here, I had no idea there would be a line. A long line. Imagine going to amusement parks when you were a child. Yeah, those kinds of lines. I had no idea. Ugh. Held at the SOMArts Cultural Center, the wait was really ridiculous. I mean, this really is no way to spend an evening, standing outside in the San Francisco cold. But I couldn’t give up. 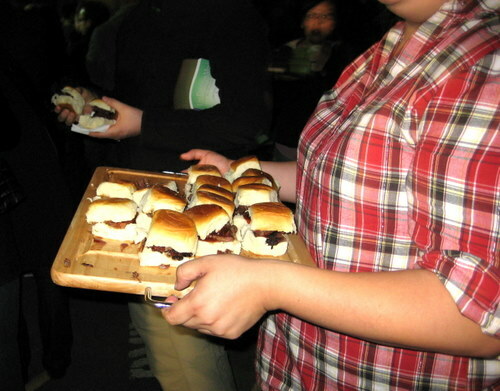 At a certain point, some of the vendors came outside and started hawking to us starving and cold ding dongs outside. Eventually, I made it inside, after what it seemed like forever. Seriously, it was a long time. I don’t want to say exactly how long because I don’t want to detract others from checking it out in the future. Basically, it was a big open room with tons of little tables set up for the vendors. And they were selling food. 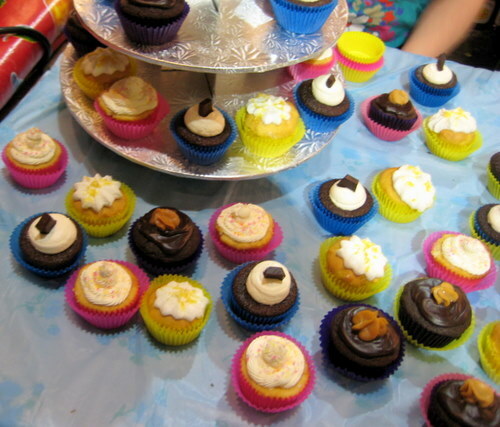 There were plenty of sweets, including chocolates, cupcakes, more cupcakes, and macarons. It makes sense, as apparently, macarons are the new cupcakes! 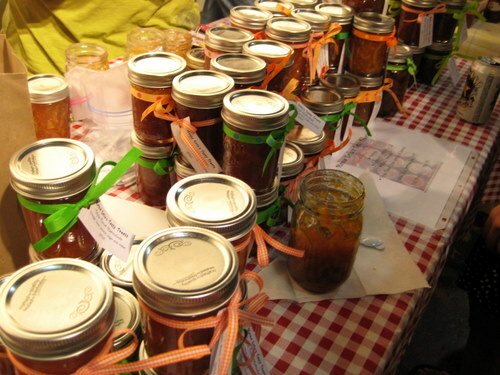 Probably after the sweets, the next most prevalent type of vendors were those with jams and preserves of all kinds. 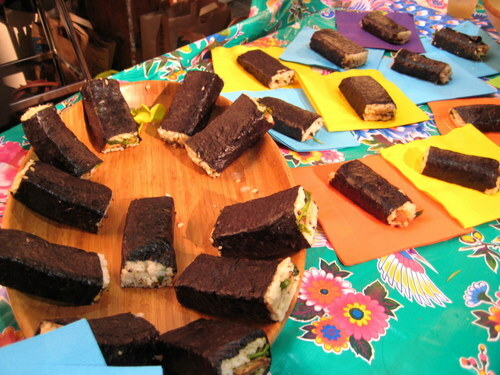 Most of the vendors have some samples you can taste. 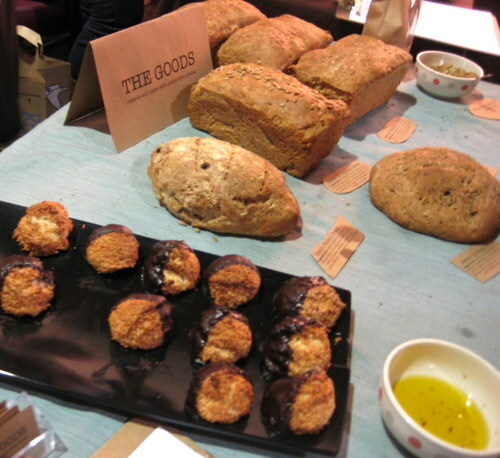 Of course there were breads. 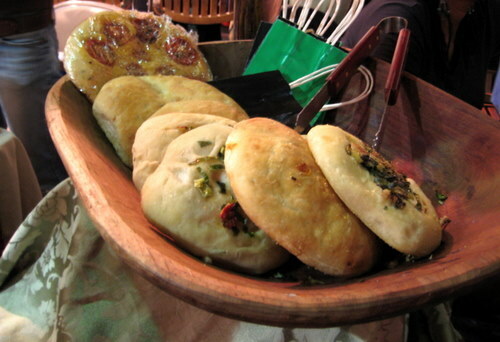 These homemade focaccias looked awesome. And in addition to macarons, there were even macaroons! One of the coolest vendors was for someone making her own spicy spices. 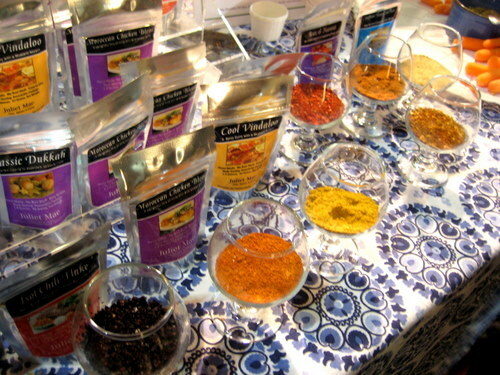 There were tons of different chili powders and lots of spices for indian food. Being in SF, asian food was well represented. We had some musubi. There was even someone selling organic kimchi. I mean seriously, kimchi samples? It was crazy. 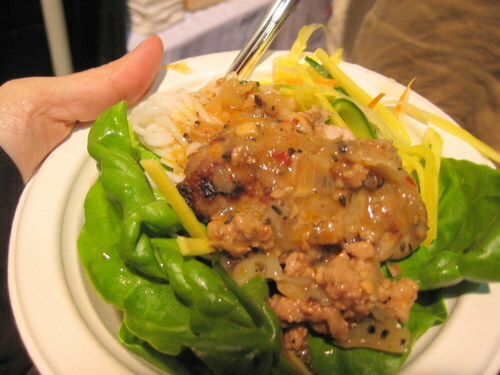 I was compelled to actually buy one thing… a pork belly sausage with peanut sauce, slopped on top of rice noodles and papaya salad. Oh yes, it was as delicious as it sounds and looks! Although annoyed by the wait, it was quite an interesting experience. If you’re in SF during the next one, stop by. Entrance is free. Just show up early to avoid the wait. The wait was extremely unpleasant, especially when you get stuck standing in front of two vapid girls who work at google that just seemed to be the most annoying people in the entire freakin frackin world.